In the world of high-horsepower diesels used in mining, engine builders seldom promote significant technical advances in terms of a “less is more” concept, but that’s the crux of the message delivered by Tognum AG’s MTU business unit at a Tier 4 Mining Engine introduction event held at the company’s facility in Aiken, South Carolina, USA. MTU’s program to develop EPA Tier 4 (T4) final-ready, large-displacement diesels began in 2004, and the result, according to its engineers and executives, is a new line of engine models that offer full emissions-reduction compliance without need of exhaust aftertreatment. That accomplishment, said MTU, means that mine-equipment OEMs and repower customers have less to worry about—not only is there no need for add-on particulate filters, urea tanks and other ancillary equipment to help its high-horsepower engines reach ultimate Tier 4 standards, the new mining engines actually have a spatial footprint that is only marginally different from their Tier 2 predecessors. Plus, there’s plenty of “more” built in to the Tier 4 Final models, according to MTU, as in more horsepower, improved fuel economy and even a higher degree of fire-hazard safety due to new thermal protection features included in the new versions. The regulatory timetable for achieving T4 Interim and Final compliance on engines rated at 750 hp (560 kW) or more has been known for years, and engine OEMs have consistently sought input from their customers on T4-related design issues, but even so, many end-users still remain unsure about what to expect when it comes time to seriously consider a move to T4 engines, said MTU’s Dr. Ingo Wintruff, vice president of application engineering. However, years of experience developing and improving various engine technologies allow MTU to have a high degree of confidence in its T4 Final solution, said Wintruff. “While customers are allowed to be nervous [about Tier 4 issues], engine manufacturers cannot” be unsure about their chosen technology, he remarked, adding that MTU has employed two major elements of its Tier 4 solution—cooled exhaust gas recirculation (EGR) and high-pressure, common rail fuel injection—in various rail and industrial versions of its engines since 2004 and 1996, respectively. In fact, MTU is using its third-generation fuel injection system in the T4 mining engines, according to Wintruff. 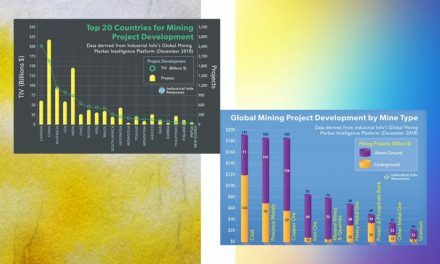 MTU’s new Series 4000 engines are based largely on the Tier 2 platform that was introduced in 2006, said Scott Woodruff, director of global mining sales, but the T4 design incorporates several new technologies aimed at achieving performance improvements. “The Series 4000 Tier 4 engine shows an improvement in fuel consumption over the Tier 2 engine, and actually has a fuel burn rate similar to our Tier 1 engine,” he said, in large part due to a new combustion system design that uses Miller cycle valve timing, increased peak cylinder pressure, and a new ADEC electronic engine control, along with cooled EGR and high-pressure common rail injection. In addition to reduced fuel consumption compared with T2 Series 4000 engines, MTU also said the T4 version has increased power, provides rapid response to changes in engine load, shows excellent performance at high altitude, and better performance at high ambient temperatures. Much of this improvement is due to the new engine’s two-stage regulated turbocharging system with charge air intercooling. The system comprises two low-pressure turbos feeding into a single high-pressure turbo, with low-pressure charge air cooled prior to reaching the second-stage turbo, and the high-pressure charge air cooled again before reaching the intake manifold. The T4 engines’ common rail fuel injection system is the latest refinement of a system that was introduced with the Series 4000 Tier 1 engines in 1996. Providing up to 1,400 bar injection pressure, the first-gen system gave way to the T2 version in 2006, rated at up to 1,800 bar. Today’s system, according to MTU, offers up to 2,500 bar for more efficient fuel utilization and reduced combustion noise. The T4 Series 4000 engine family will consist of the 20-cylinder 20V4000, the 16-cylinder 16V4000, 12-cylinder 12V4000 and a new model—the 8-cylinder 8V4000, a 38-liter-displacement engine rated at 1,085–1,600 hp and aimed at the hydraulic excavator/blasthole drill equipment segment. Slated for market introduction in 2015, the T4 Series 4000 models represent the end result of a design, development, qualification and testing program that began in 2004 with pre-testing of new, key technologies that would eventually be incorporated into the T4 engine line. MTU began test-stand evaluation of the T4 engine design in 2009 and field qualification in 2011. 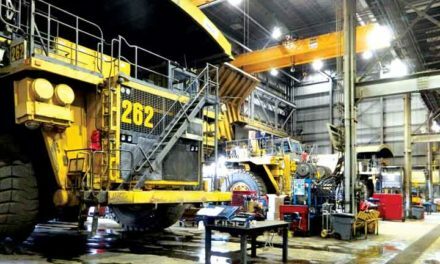 Field testing of the T4 mining engine began in June 2012 at a Nevada gold mine—a site chosen for its high ambient temperatures and above-average engine load factor. 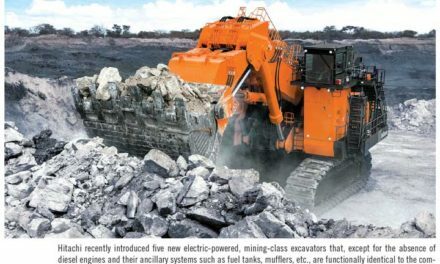 According to the company, its 12-cylinder 12V4000 rated at 2,500 hp has been installed in a 320-ton-capacity mine truck that is usually powered by a 16-cylinder diesel. MTU said it purposely selected the site, with its demanding operational and environmental conditions, to prove T4 Series 4000 component reliability prior to market introduction. MTU’s Series 2000 T4 engines have followed a development path similar to their Series 4000 stablemates. The T1 line was introduced in 1997 as 8-, 12-, and 16-cylinder models spanning the 605–1,340-hp range and intended to replace the company’s Detroit Diesel two-cycle engines—which would have had difficulty achieving new emissions standards. The T2 family entered the market in 2006, based on the T1 design but with improvements such as improved piston design along with a new fuel injection system, camshaft, oil cooler and engine calibration. At that time, MTU dropped the eight-cylinder S2000 model but kept the 12- and 16-cylinder versions. MTU introduced its T4 Interim Series 2000 models in January 2011, keeping both the 12- and 16-cylinder models and maintaining their power ratings at 1,050 and 1,300 hp, respectively, but now offering a 10% reduction in fuel consumption over the T2 versions. In addition, the 16-cylinder mining engine was completely redesigned, featuring increased bore and stroke, longer-life steel pistons, improved cylinder head design with larger valve diameters, an improved fuel injection system served by two Bosch injection pumps, and a two-stage regulated turbocharging system with two-stage charge air cooling. The turbocharging system, according to MTU, provided several performance advantages that include quick response to changing engine load; a full, flat torque curve; full power availability at altitudes up to 10,200 ft; and full power in ambient temperatures of up to 131°F (55°C). As is the case with the Series 4000 T4 engines, MTU’s Series 2000 T4 models will not require aftertreatment. The advanced turbocharging setup, according to MTU, allows the T4 engines to reduce particulate emissions; and the cooled EGR technology lowers combustion temperatures which, in turn, leads to reduced NOx emissions. In MTU’s EGR setup, regulating valves on each exhaust manifold control the number of cylinders that “donate” their exhaust—on the 12-cylinder model, for example, up to four cylinders may feed exhaust gas into the EGR system, where it is first sent to an EGR cooler and then to the intake manifold via EGR injection pipes. MTU began field testing of a Tier 4 Final 12-cylinder engine at an African mine site in March 2012. Although MTU can’t make a similar claim of ‘no aftertreatment required’ for its low-power range (LPR) engines because of stricter mandated emissions standards for the under-750-hp range, it has managed to eliminate any need for Diesel Particulate Filters (DPF) or Diesel Oxidation Catalysts (DOC) on its current T4 Interim LPR engine models, a feature that will carry through to its T4 Final versions. Instead, the company will incorporate a combination of cooled EGR, Selective Catalytic Reduction (SCR), selective single- or dual-stage turbocharging and high-pressure common rail fuel injection to obtain the necessary reduction in emissions stipulated by T4 Final standards. MTU’s current T4 Interim range of LPR engines includes the Series 900, Series 460 and Series 500 models. The Series 900 offers a rated power range of 127–322 hp and includes both 4.8-liter, four-cylinder and 7.2-liter, six-cylinder inline models. The Series 460 consists of an inline, 12.8-liter, six-cylinder model rated at 355–503 hp. The two Series 500 engines are V-models, with six- and eight-cylinder versions covering a power range of 355–644 hp. All T4 Interim LPR engines employ SCR. The company’s LPR T4 Final lineup will comprise five engine series: the 1000, 1100, 1300, 1500 and 1600. According to MTU engineers, the Series 1000 will be the ‘next-generation’ Series 900, while the 1600 will be a completely new design. The collective series are divided into three engine families: the Series 1000; the Series 1100, 1300 and 1500; and the 1600. All will be based on a common concept for achieving T4 Final emissions standards, and all—except for the Series 1600—will use a combination of cooled EGR plus SCR. MTU was quick to point out that its SCR system will be ‘airless,’ with no need for compressed air to assist with dosage injection. All engines in the new Tier 4 lineup will offer optional engine exhaust brakes, with the S1600 engines’ brake employing hydraulic actuation. The new Series 1000 family will consist of two inline models: a 5.1-liter, 4-cylinder version and a 7.7-liter 6-cylinder model. Both will be OHC designs with four valves per cylinder. The Series 1100, 1300 and 1500 engines derive their design background from proven Detroit Diesel predecessors, according to the company. All engines in the family will be DOHC models with two inlet and exhaust valves per cylinder, will feature wet cylinder liners and offer a rear gear train configuration with REPTO (rear engine PTO) option. The V-model Series 1600 family will consist of two new engines: the 17.5-liter, 10-cylinder 10V1600 and the 21-liter, 12-cylinder 12V1600. Both models will be OHC units with four valves per cylinder, two-stage turbocharging and regulated, cooled EGR. Power ratings span the 760–979-hp range. Production of the Tier 4 Series 2000 and 4000 engines for the North American market will come from MTU’s Aiken, South Carolina, assembly plant, which it acquired in March 2010, and after extensive upgrades, put into operation a year later. MTU subsequently announced two separate investment programs for the plant: the first, for $45 million, was the initial commitment for plant renovation and expansion; the second, announced in March 2012, was for an additional $45 million, mainly to construct two new R&D buildings that will house engine test facilities.